In the wake of the tragic deaths of two exceptional young Island School students in 1985, the Nicola Myers and Kenneth McBride Memorial Fund (NMKM), which was named after the two victims, was set up to benefit local students who have great financial needs in funding their education. This fund hopes to help keep Nicola Myers’ and Kenneth McBride’s ideals and compassion for others alive in support of needy and exceptional local students. This year, over 180 applications have been received and priority goes to those who are suffering through family misfortune. 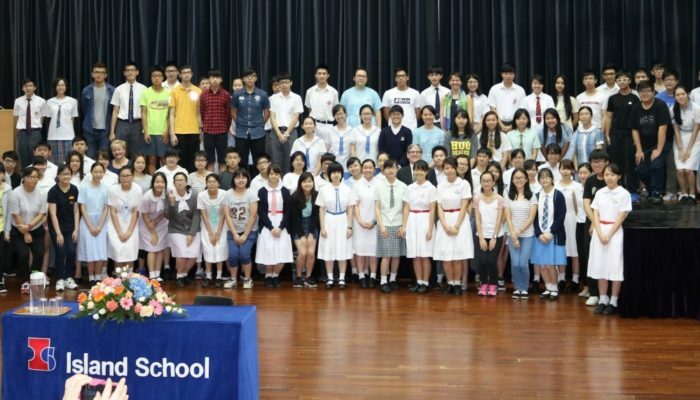 Approximately HK$250,000 worth of sponsorships will be awarded to a total of 101 Form 6 students from local schools, each with a fixed sum of HK$2,500, enabling them to continue with their education. Money was raised by ESF Island School Parent Teacher Association through the sale of raffle tickets. Half the profits go to the NMKM Fund, while the other half is used to purchase resources for the school. Funding also comes from donors from within the Island School Community. An award ceremony was held today at ESF Island School. One of the awardees, Lam Sio Fan who studies at Baptist Lui Ming Choi Secondary School, suffers from eye cancer and lost her sight when she was two years old. She has shown perseverance and has attained excellent results in a wide range of subjects. Another awardee has lost both parents and has lived in different foster homes. She has never given up and actively participates in different activities and hopes to study abroad in Taiwan after graduation. The mother of a student from Chinese YMCA College died of cancer last year which made him determined to be a doctor. He plans to further his students at the Chinese University of Hong Kong. Speaking at the ceremony, Chris Binge, the Island School Principal highlighted that the NMKM fund is life-changing. “The Fund gets many applications from students who crucially need financial support and the support we can give through the NMKM Fund changes lives. The most important thing that the recipients say is that the awards show that people care about them,” he explained.